At the beginning of the year I put a post up on my facebook page listing off some various replicas I wanted to make in the hopes that some people might ask me to build them. I feel like I do my best work when I’m really invested in a project, and it was my hope that there were like-minded fans out there that would think some of the crazy stuff I felt like building was something they’d feel like having built. 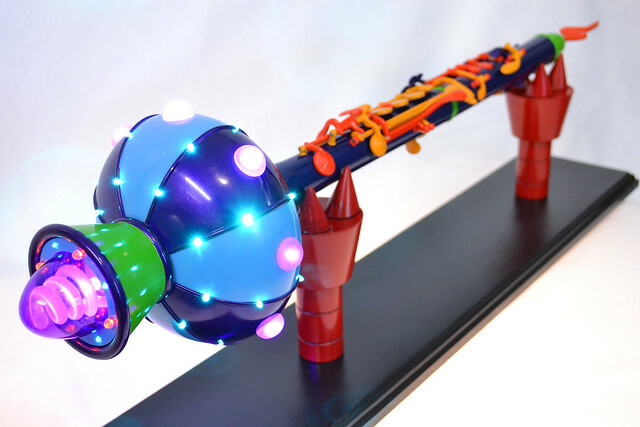 One of the stranger ones was the Holophonor, an over the top holograph-projecting clarinet/oboe hybrid bristling with lights. I had a client express interest in having a full scale real world model built, so I started gathering about a billion screencaps from the series. 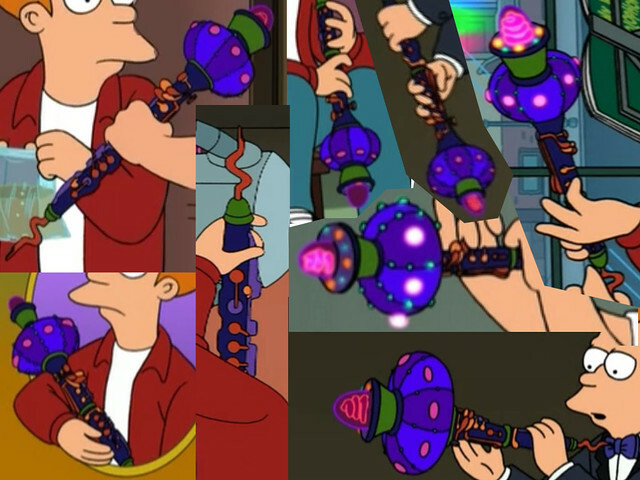 Since Futurama is hand drawn, the Holophonor varies wildly from shot to shot. Sometimes whole sets of keys are missing, sometimes it looks about a foot shorter then normal, and the lower bell seems to be anywhere from 6″ around to over 18″ depending on which frame you’re looking at. I fired up Netflix and grabbed a ton of reference. 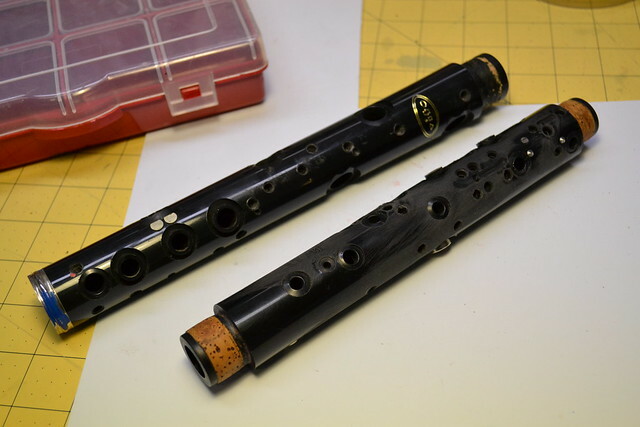 The keys in some of the more detailed shots reminded me of a clarinet, and the more I checked, the more that I was certain the Holophonor was inspired by one – the grouping of the 4 long keys at the bottom, the same number of front facing valves, even the very long upper hinged keys. I drew up some blueprints. 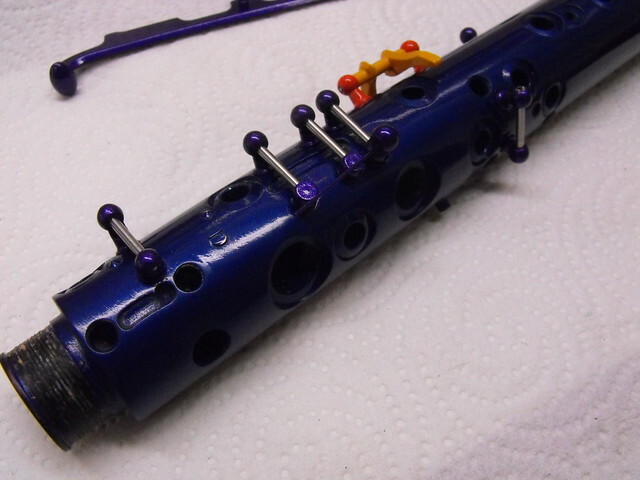 Since this piece is mostly a clarinet, I decided to mod an existing instrument instead of building one entirely from scratch. After scouring craigslist for a used piece, I found a, uh, “winner” – a $70 “Vito” brand clarinet at a thrift shop downtown. This thing was disgusting. I don’t know who owned it or for how long, but it was filled with… well, it was gross. We’ll leave it at that. 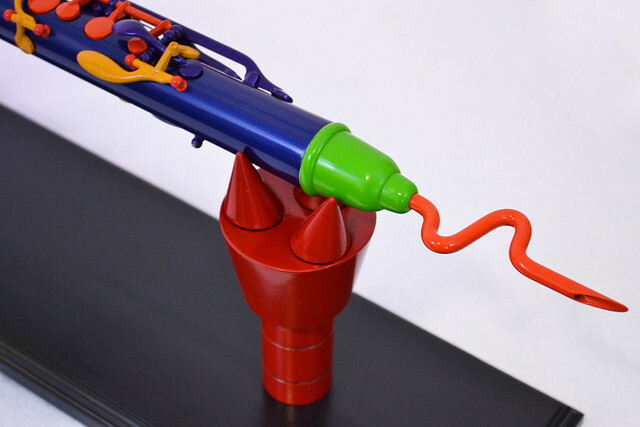 Referencing the blueprints, I marked keys and triggers with different color paint pen before dis-assembly. This way I know which ones to paint what color later on down the road. I also took a ton of photos like this, as well as some time lapse shots of the tear down, so I’d know how things should be assembled when the time came. 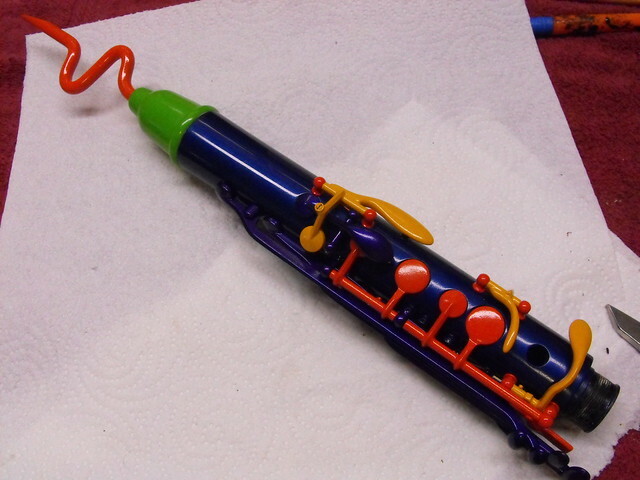 Fun fact if you’re planning on doing this – cheap plastic clarinets are injection molded ABS plastic. 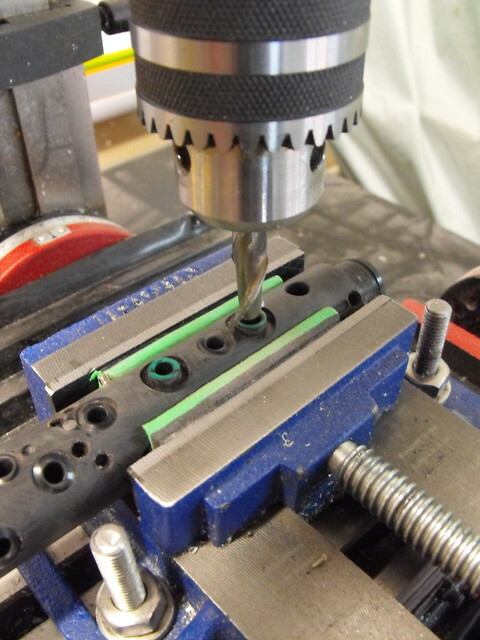 Those little standoffs in the pic above aren’t screwed in – they’re pressed in place while the peg is heated, and the cooling plastic keeps them locked in. To remove them, I heated each peg carefully with a blowtorch to soften the surrounding plastic, then pulled them out before it cooled. 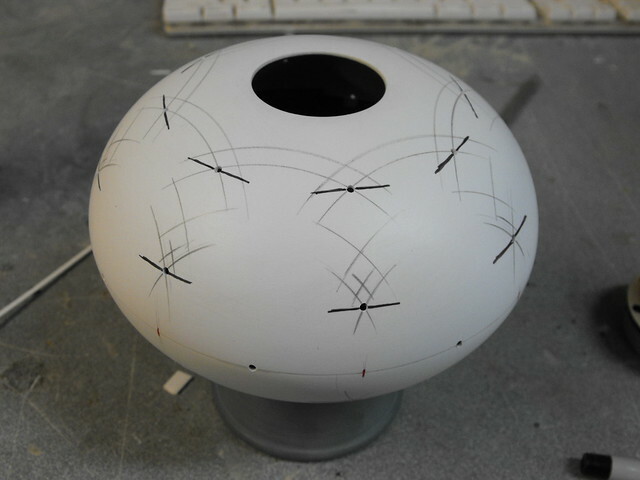 The body isn’t a perfect match – the lowermost valve is missing on the Holophonor, and has been replaced with a widened bell that flares out before meeting up with the illuminated ball on the end of the instrument. 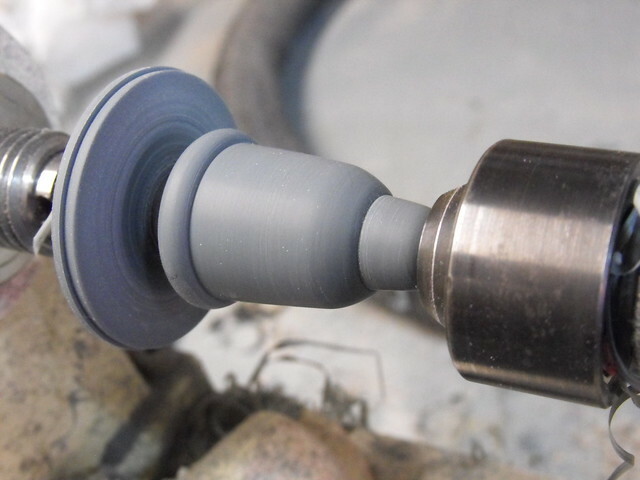 I had to lop about 2″ off the bottom of the clarinet body, which I did with my lathe. The Holophonor also doesn’t have any open keys, so these need to be plugged. 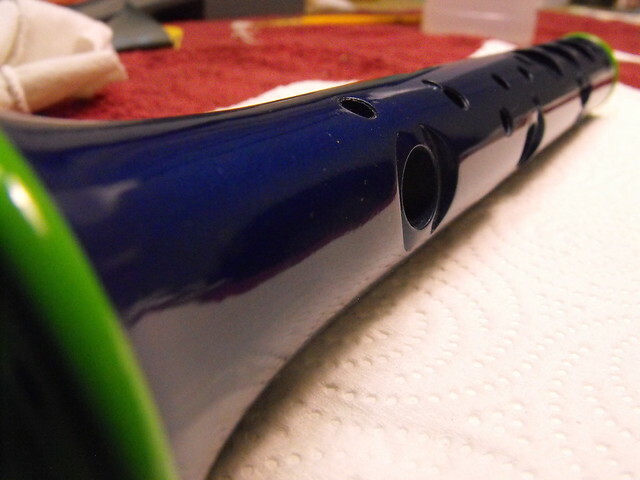 The body of the clarinet has raised portions here that also needed to be milled flush if the keys were getting capped off. 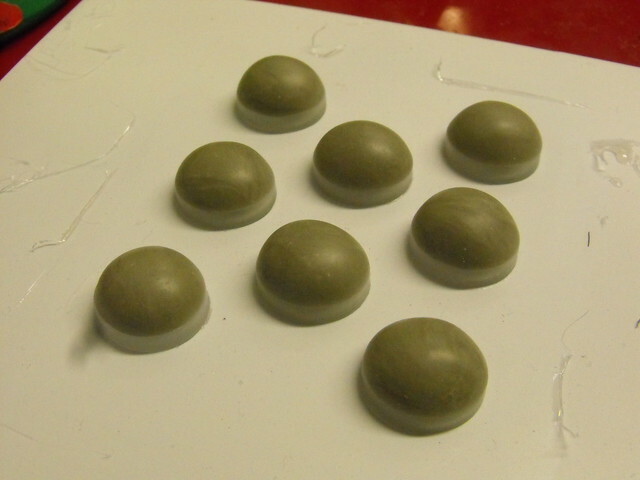 The associated open keys were filled in with epoxy clay and sanded smooth. 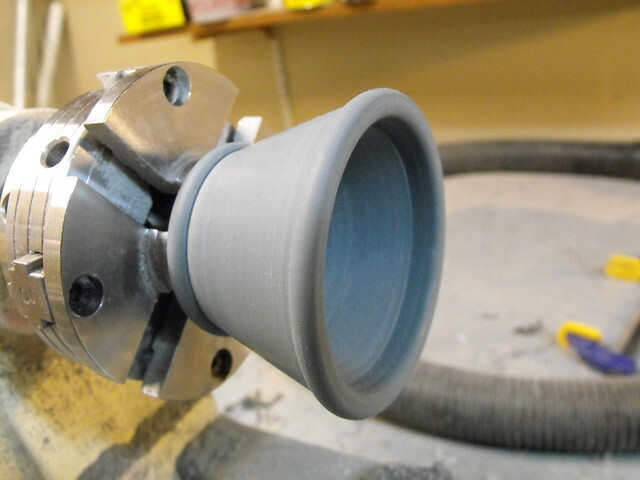 The “mouthpiece” where the eventual reed will sit. 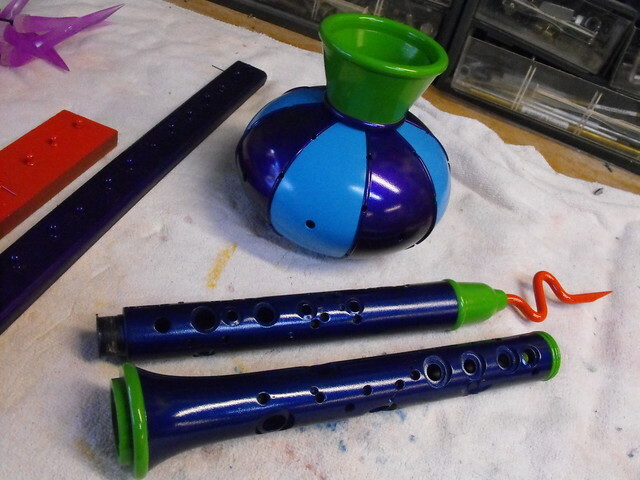 Flared bell to replace the 2″ of the clarinet body I lopped off. 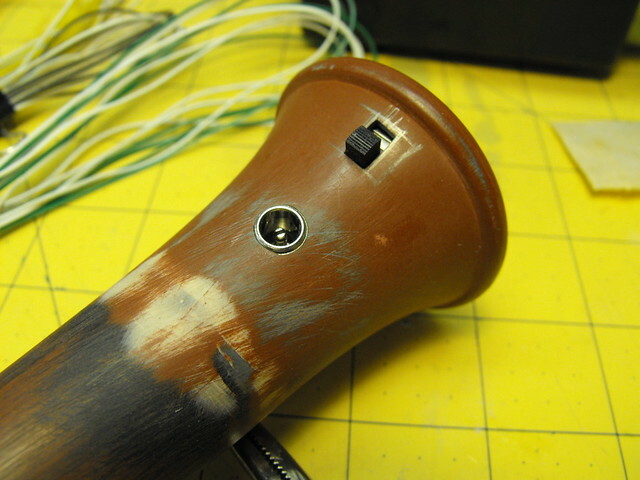 Lower horn with bulb blank inserted. The bulb will eventually be vacformed from clear PETG and dyed red. This is just the vacform buck. 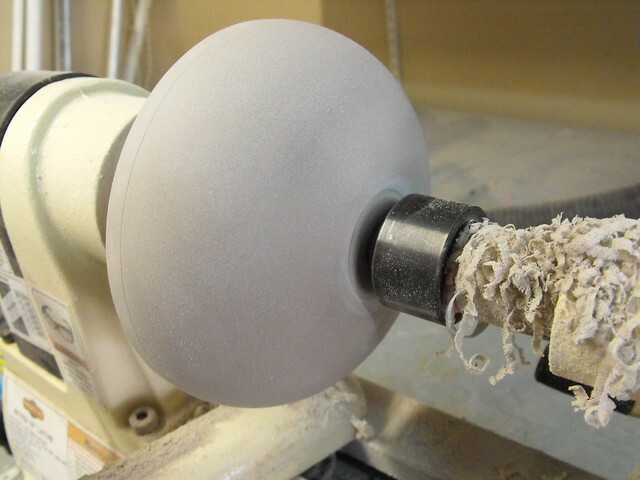 The illuminated lower ball is going to be made from two styrene halves. 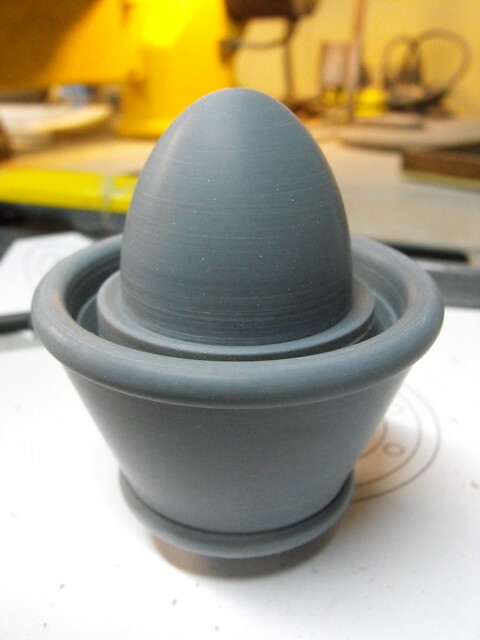 I made the vacform buck from some 20# urethane tooling foam. 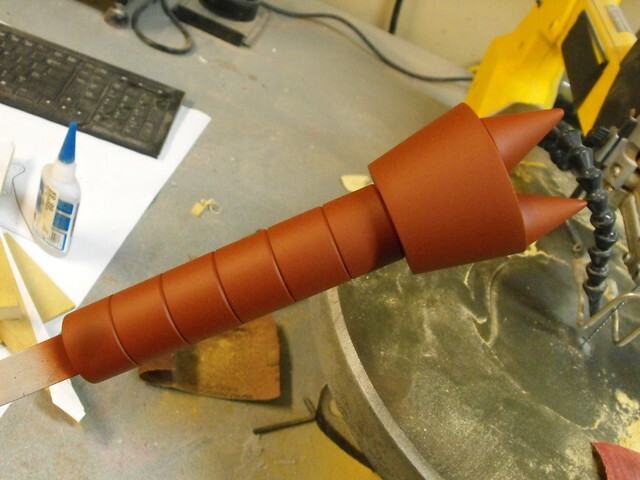 The, erm, lower horn is mounted to the lower section of the bell with 4 screws. Once the two halves are assembled, this guy isn’t going to be able to be removed again. Two halves glued up, and seam filled. 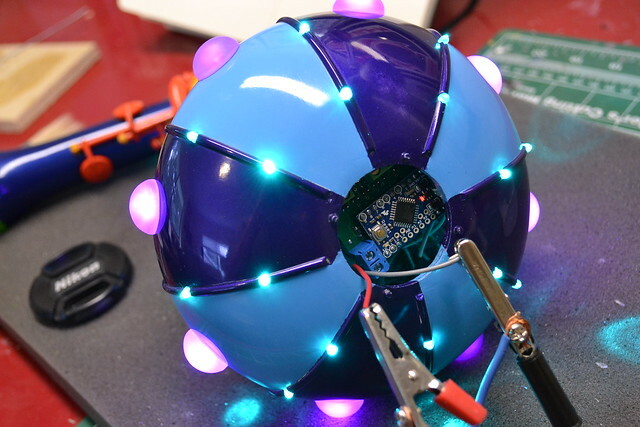 The small holes are markers for the perimeter pink LEDs. 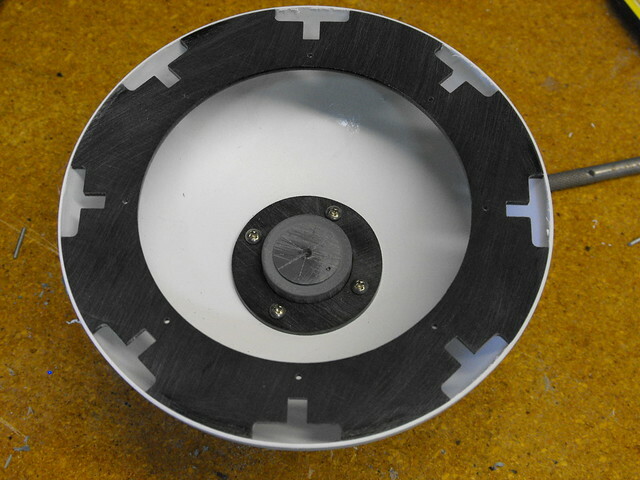 From these little holes I was able to extrapolate the distances to the 8 rows of 4 LEDs that make up the 8 painted sections on the bell. 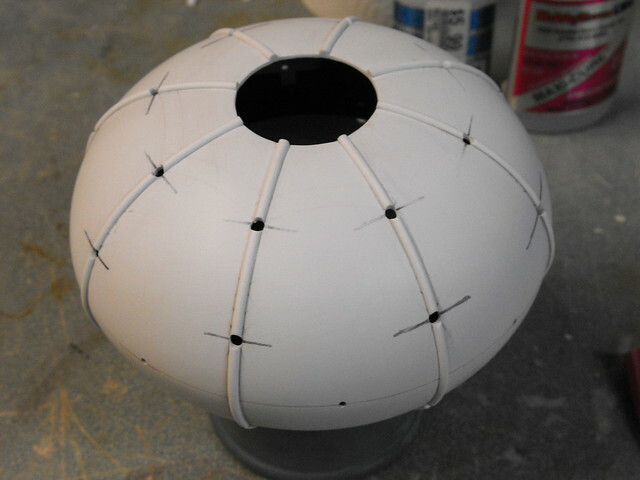 First I marked everything up and drilled small pilot holes where the 4-row LEDs would sit. 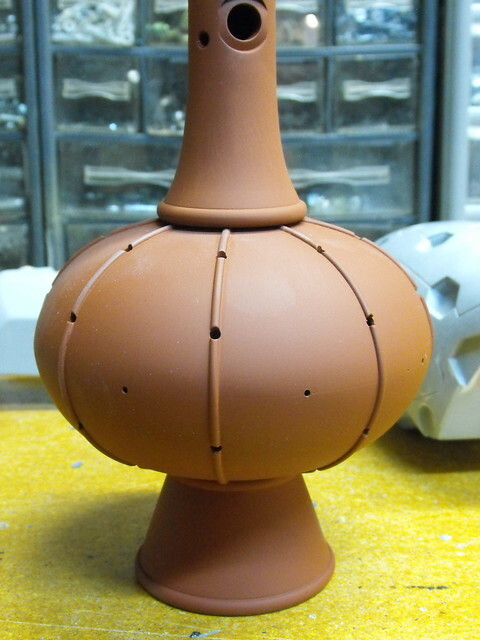 Added some .1″ styrene to the bell and drilled out the LED holes – started with a small drill bit then gradually moved up to an engraving bit on my dremel to open to holes up. 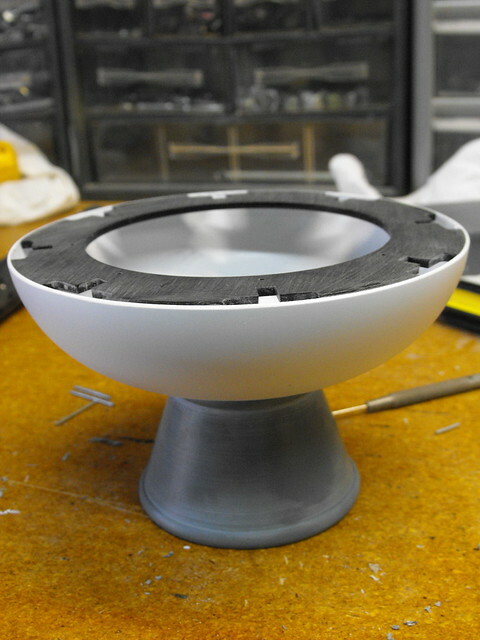 Mockup of parts in place. 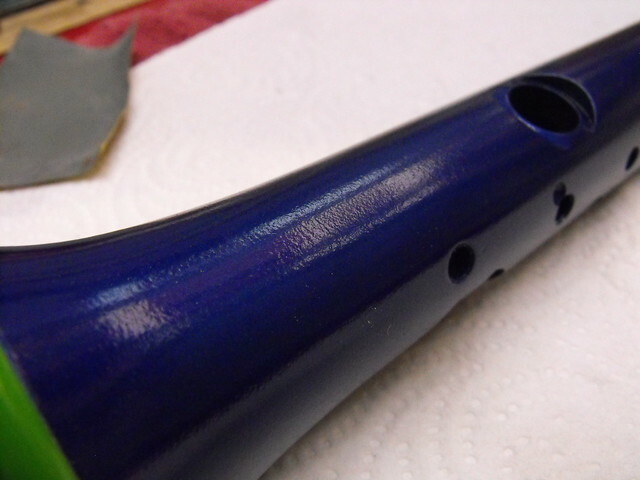 This is also after I blended the upper horn into the clarinet body. 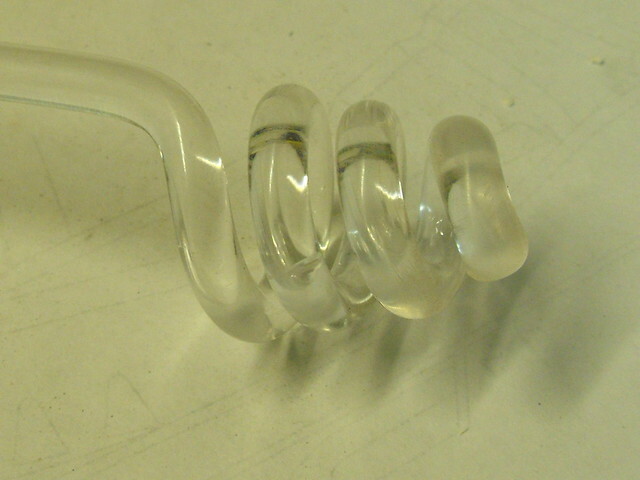 The little curly element inside is 1/4″ acrylic rod. 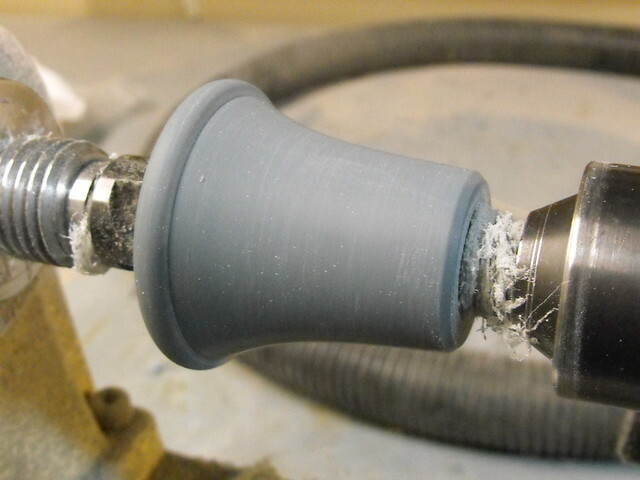 I heated it and bent it around a cone-shaped piece I had left over from a previous project to get the tapered spiral. 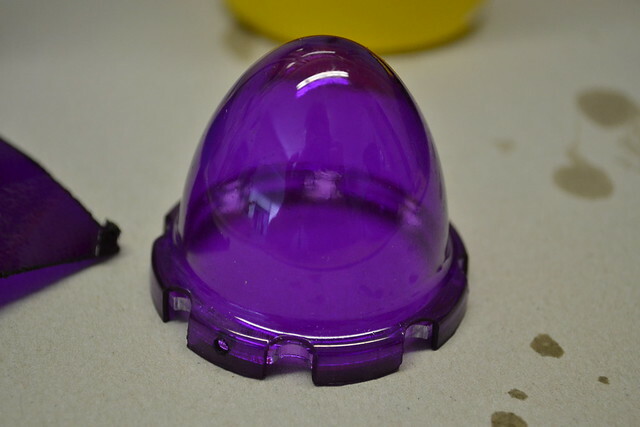 I dyed the lens purple with Jaquard “iDye Poly” which was suggested to me by my friend Eric. 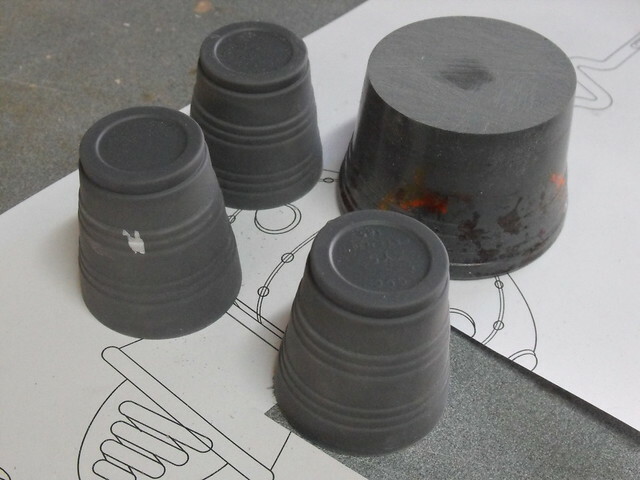 It has to get hotter to dye plastic, but it does a much better job than RIT and the color is much darker, achieved after just one pass in the dye bath. 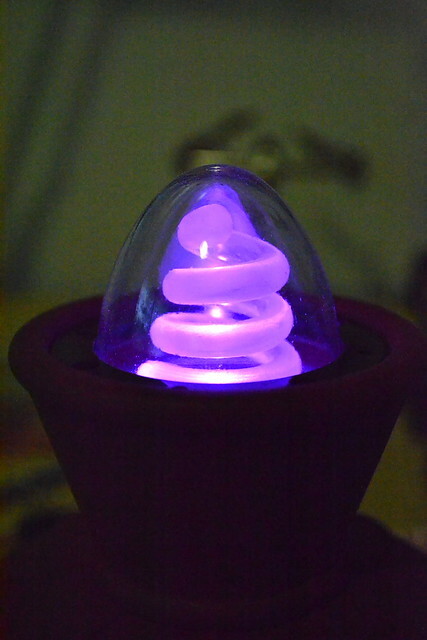 The squiggle thing is illuminated with 2 pink 5mm LEDs. 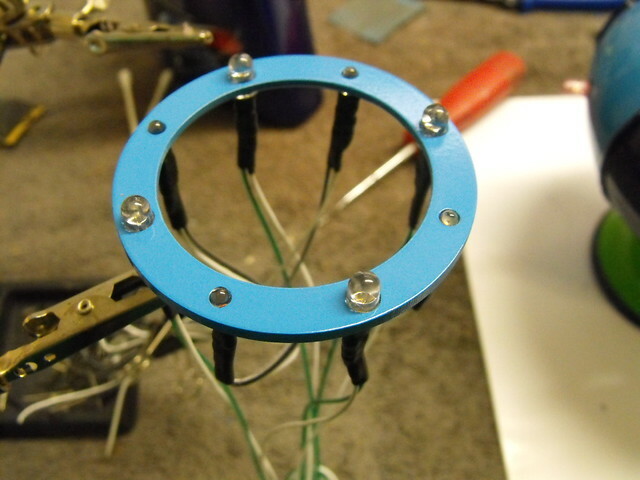 Speaking of LEDs, I spent a looooooong time soldering pigtails for the 54 LEDs that will be housed in the lower bell. There are 40 aqua bulbs, 10 pink, and 4 orange. 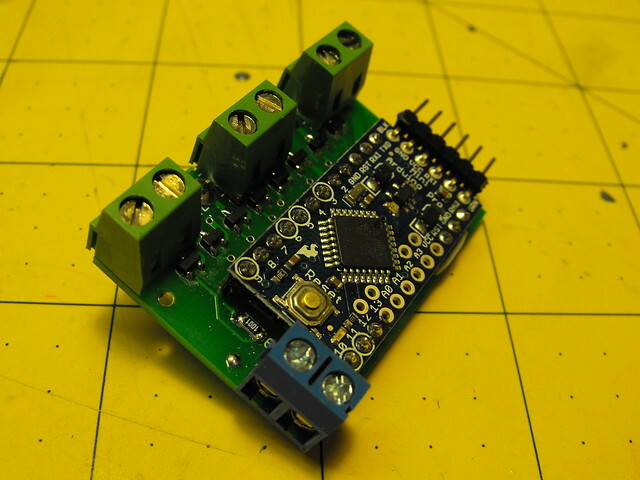 I also designed a breakout board for the Arduino that will end up controlling the illumination sequence. For this I needed 4 fading channels and 4 blinking channels. I’m not exactly a coding genius, so this took me a little while. 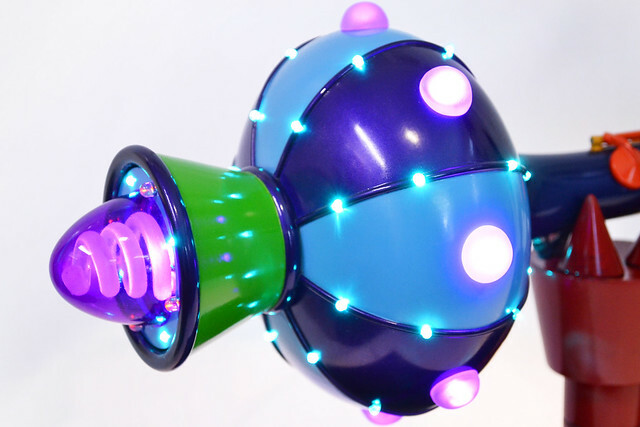 The holophonor needed to be able to illuminate from battery or a wall power adapter. A 3 position (on-off-on) switch selects power from either 3 AAA batteries housed in the lower section of the main body, or from a jack situated just above the power switch that will eventually go to a wall AC adapter. 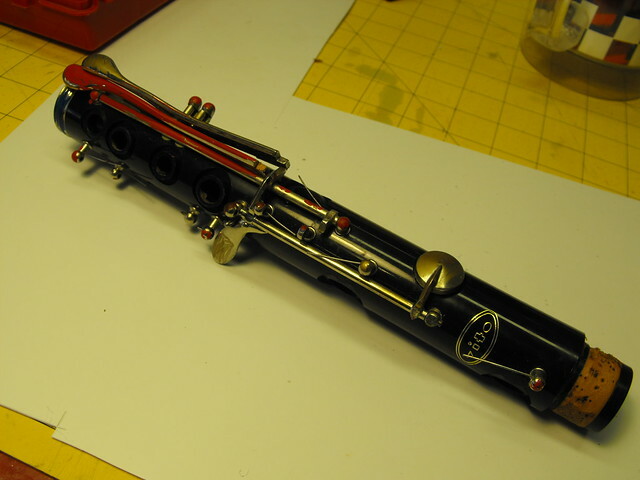 I couldn’t find a battery holder that would fit inside the clarinet body, so I needed to make one from scratch. 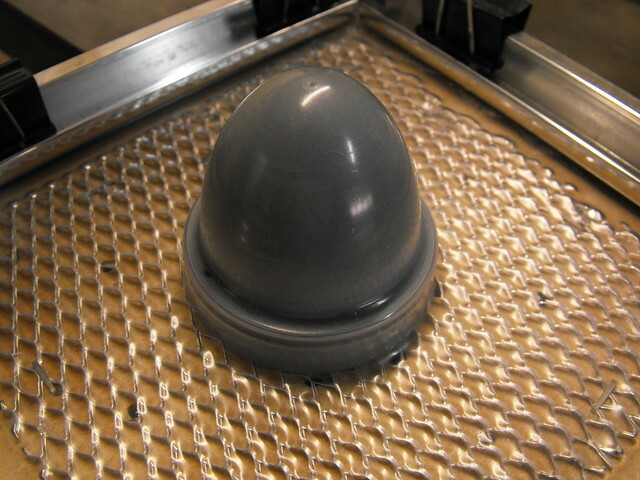 The tube here is a piece of fiberglass pipe with a small spring secured to its base. 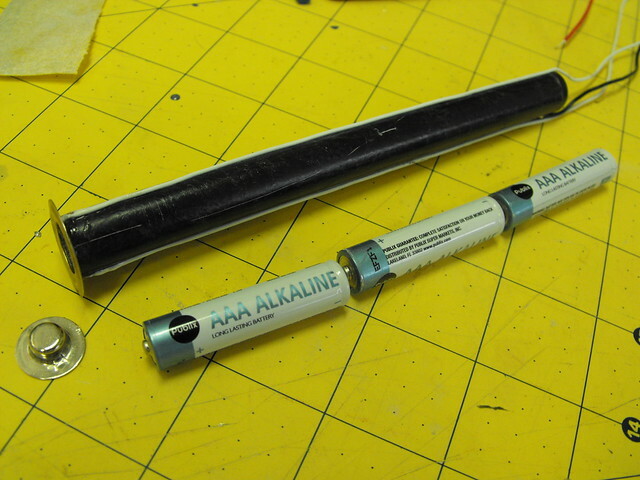 This spring is soldered to a wire which makes up the ground connection for the 3 AAA batteries. 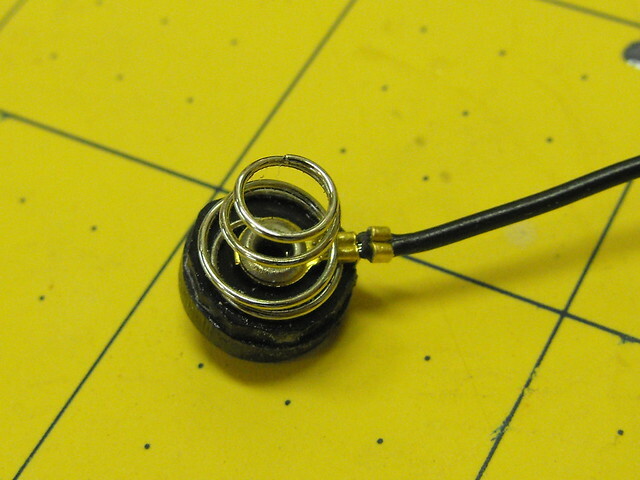 Up top, a steel ring is soldered to two white wires which make up the positive side of the circuit. 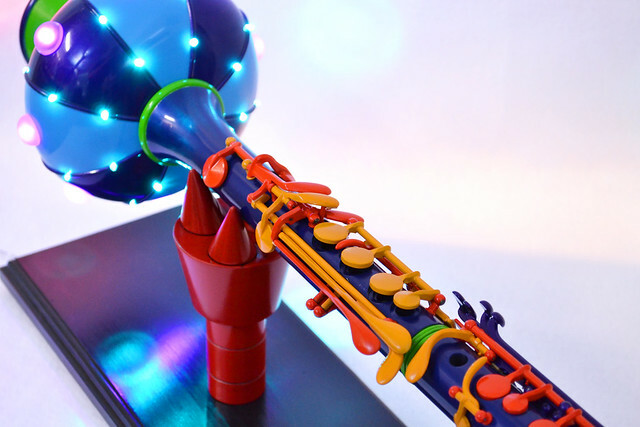 When batteries are placed in the holder they don’t make a connection until the clarinet is assembled. 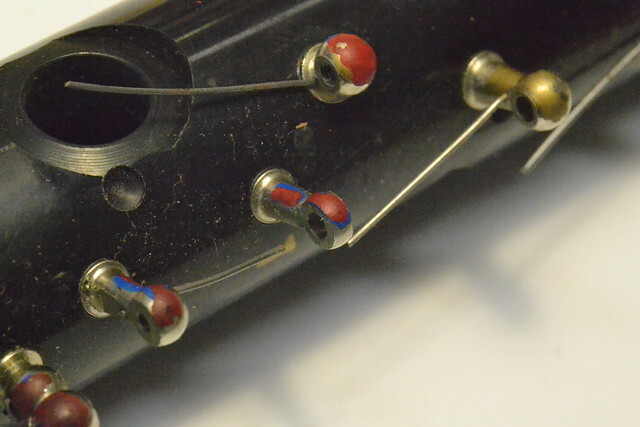 A metal plate secured to the upper section of the clarinet body completes the circuit on the positive side when the two halves are put together. 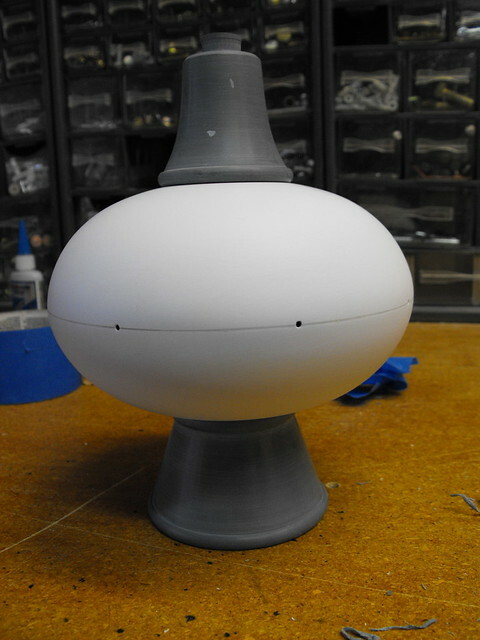 With the fabrication complete, it was time for paint. 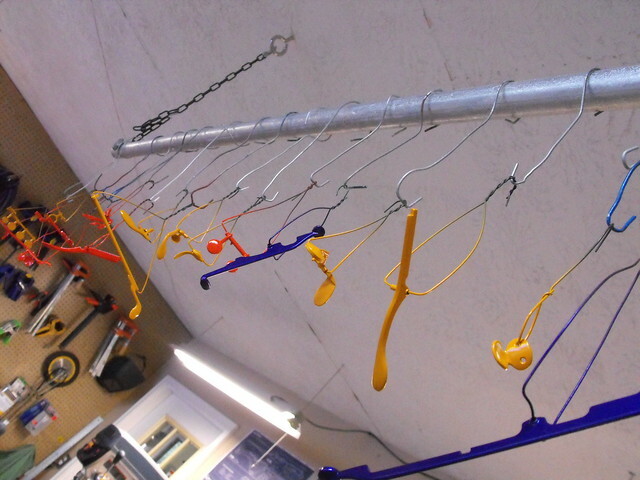 The paint I’m using here is Testor’s spray lacquer in a multitude of shades. 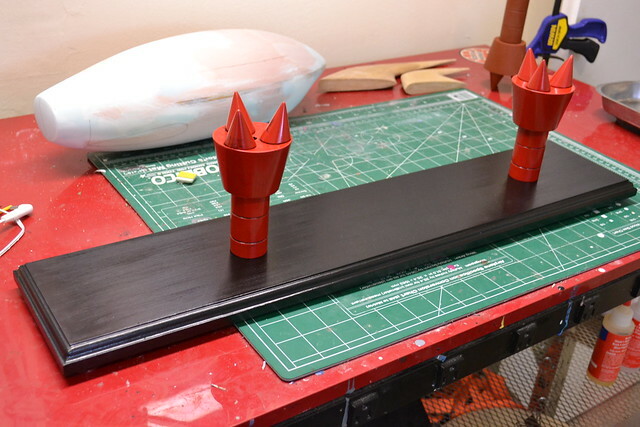 I spent a lot of time wet sanding orange peel out of the clear coat for a smoother look. 2,000 grit paper, then fine cut rubbing compound, then a few coats of wax makes a huge difference. 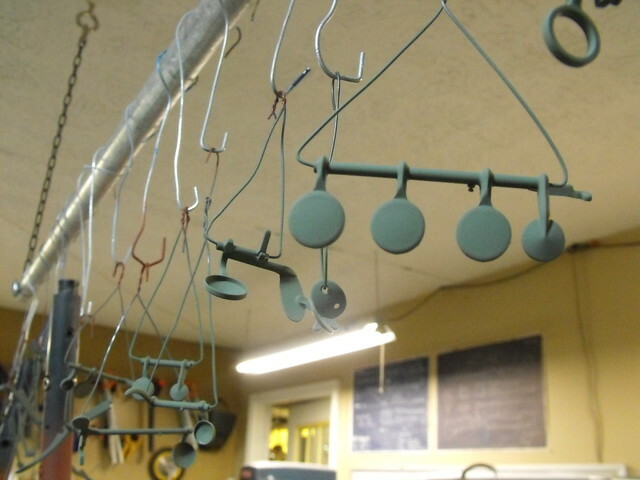 Each of the metal keys was first prepped with a wire wheel before zinc etching primer to make sure the paint would be as resilient as possible. 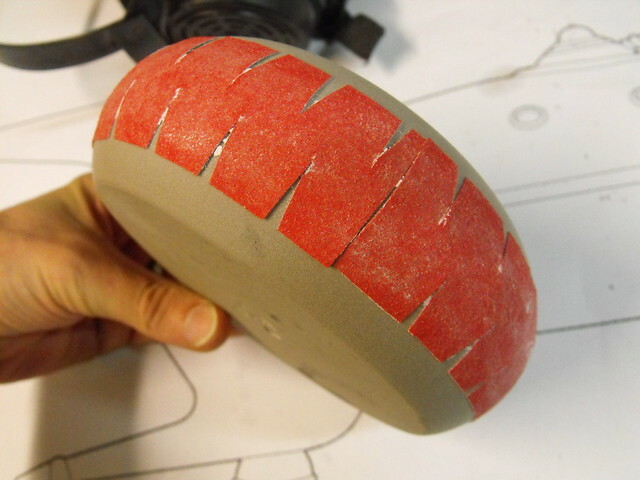 I added cork pads to keep them from scratching the finish on the main body when they’re pressed down. 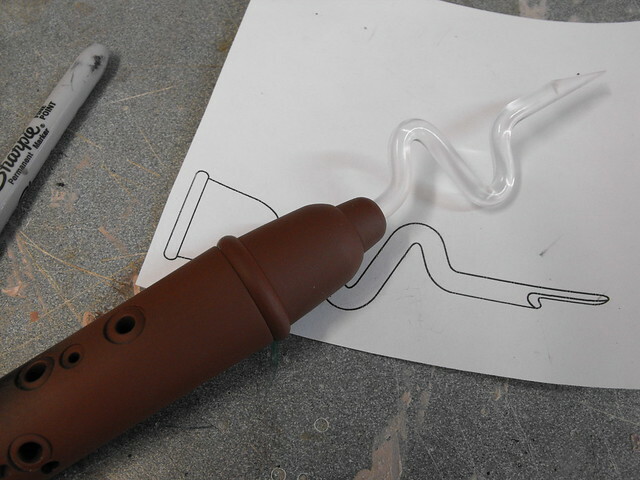 Assembly was very tedious and nerve wracking. 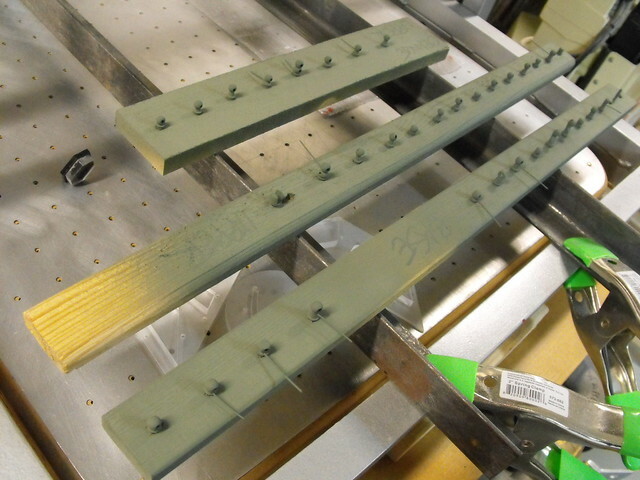 All the mounting pins were first epoxied into place with their pivot pins in place to make sure they were all in register to one another. Once that cured, the keys were screwed into place. 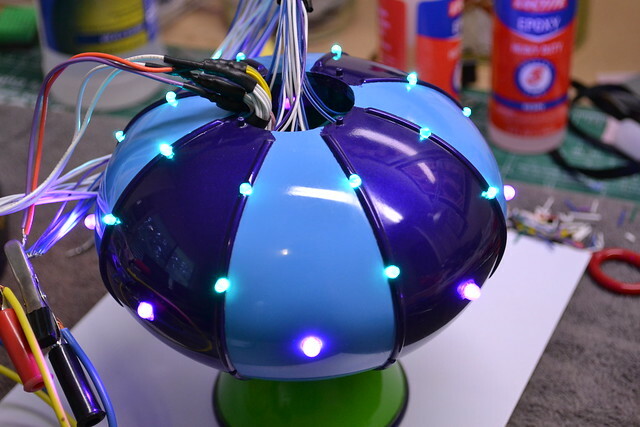 It took quite a long time to get all the LEDs glued in place. 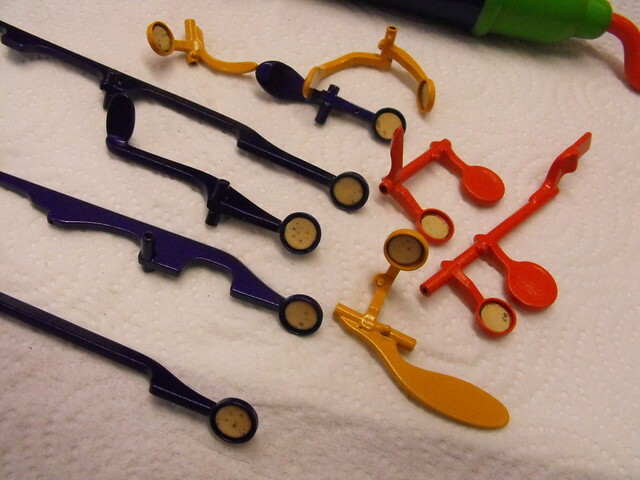 I used 5 minute epoxy to secure them but because of their somewhat loose mounting positions I could only do 4 at a time before leaving the assembly to cure. If I tried to do more than that I’d knock the other ones loose from bumping up against the wiring. 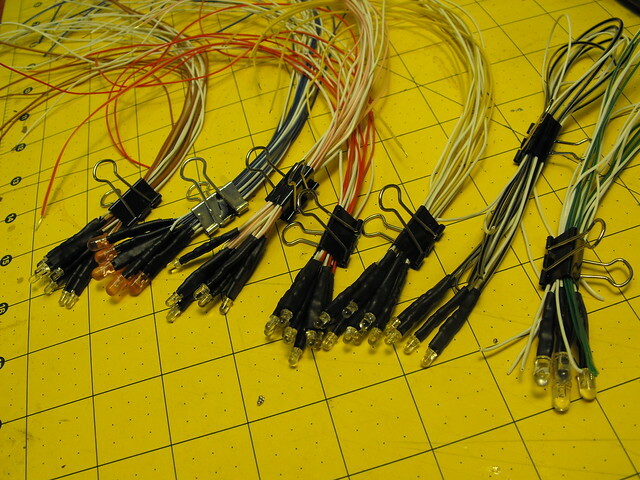 Here’s a shot of the wires for the first two rows of green and half of the pink LEDs. 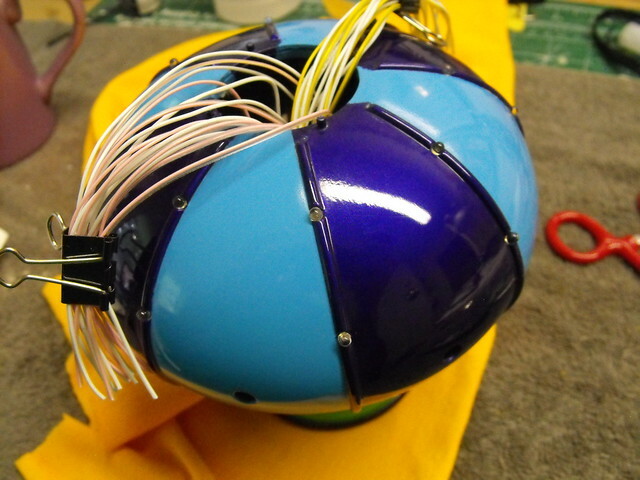 That’s about 1/3 of the wires that eventually fill up the bell. In retrospect I might have been able to daisy chain them together to make the wires shorter, but I’m not sure if that would have made mounting and assembly more difficult. 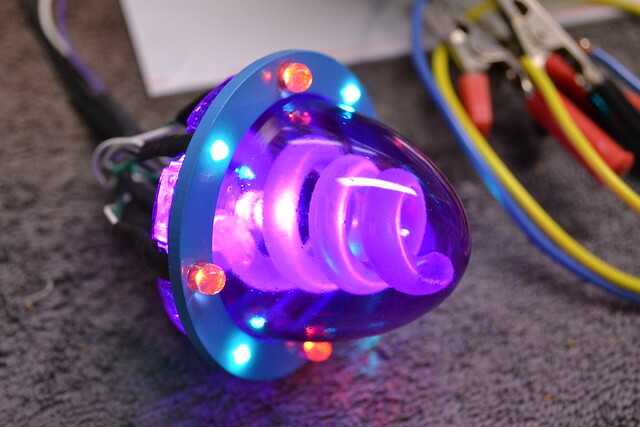 This is the light ring that goes around the curly bell at the bottom. 4 orange 5mm bulbs and 4 green 3mm. And all illuminated! This part is BRIGHT. The Holophonor might not be able to project holographic images, but it will make cool patterns on the wall from 15 feet away. The large pink lenses that fit over the perimeter lights were sculpted from apoxie sculpt then pressure cast in translucent pink resin. 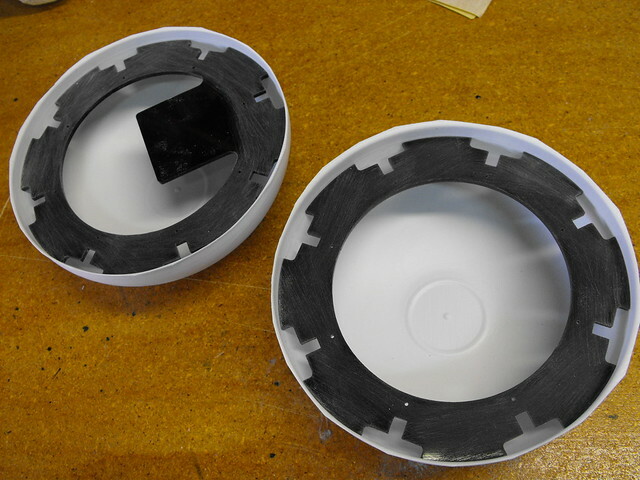 These lenses were epoxied into place over the pink LEDs and left to cure overnight. 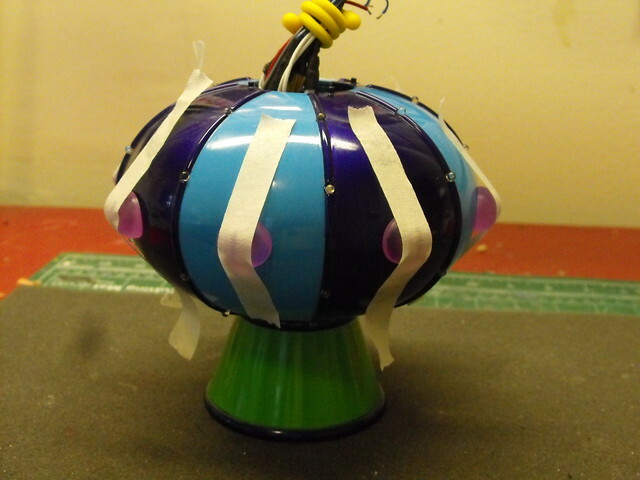 Here’s the Holophonor with all the wires crammed inside and running the blinking code off an Arduino Mini. 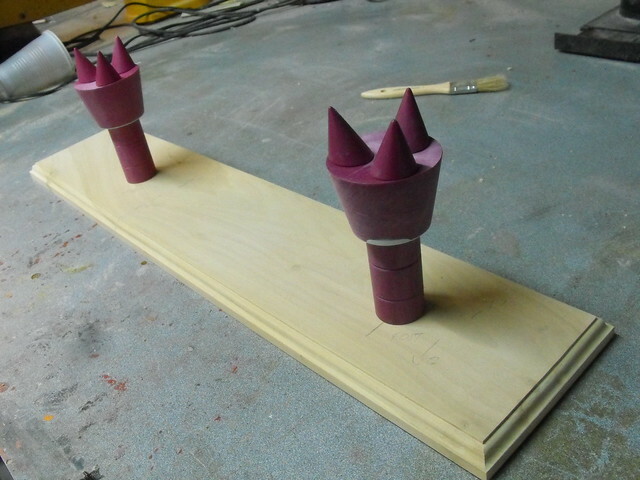 At this point the instrument was pretty much complete, but it needed a fancy display stand. I think anyone familiar with Futurama would see where this was headed. Obviously you need a set of Robot Devil hands if you’re ever planning on playing the thing! I made two copies and ran the power supply wire up through the one situated near the lower bell. 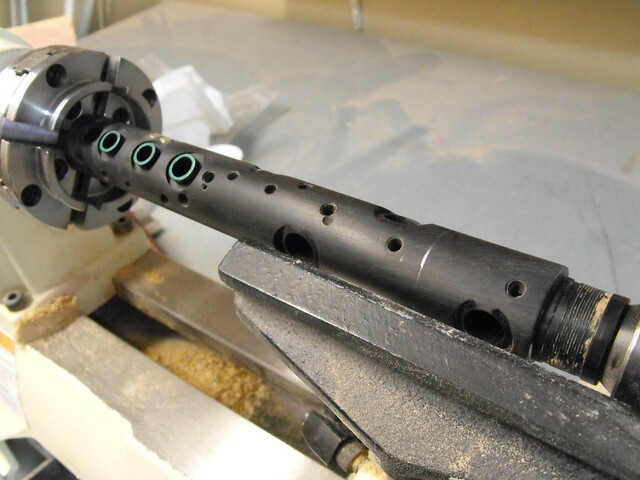 A poplar base was painted semi gloss black for that classy look. Here’s the finished product! I can say this is definitely one of the stranger things I’ve ever built, and I’m very glad to have had the opportunity to build it. 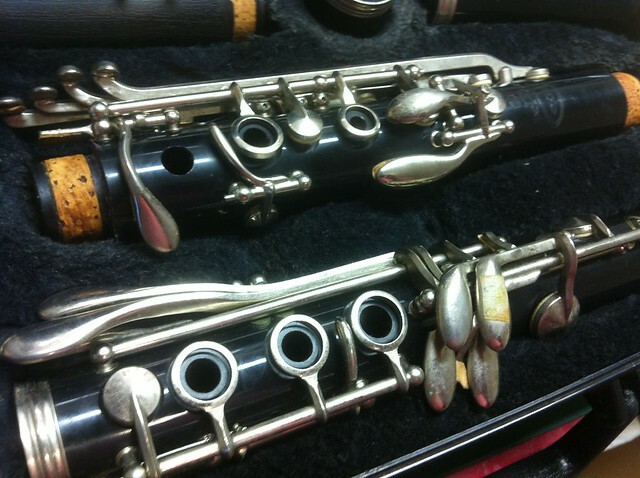 I just never want to take apart and clean a thrift-store-purchased clarinet again for the rest of my life. 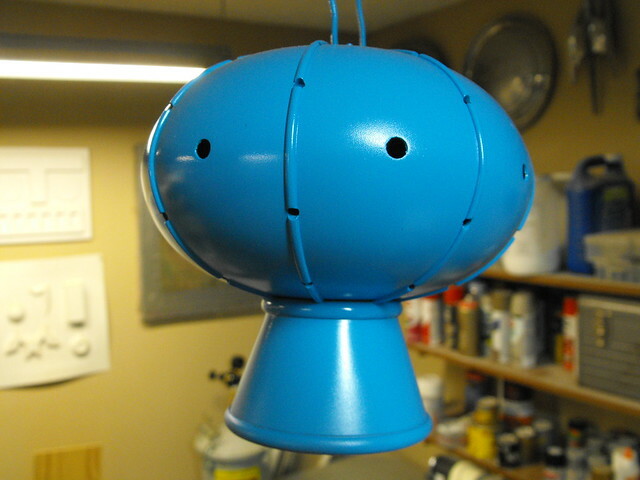 Check out the gallery for more finished photos, and my Flickr for more in-progress shots.